LONDON (Reuters) – Kingfisher (KGF.L), Europe’s biggest home improvement retailer, said on Tuesday it planned to close about 60 underperforming B&Q stores in Britain as the group posted a 7.5 percent fall in annual profit. The store closures form part of new Chief Executive Veronique Laury’s plan to shake-up the group. She succeeded Ian Cheshire in December. B&Q currently trades from 360 stores and the planned closures will represent about 15 percent of the chain’s space. Kingfisher said Kevin O’Byrne CEO for B&Q UK and Ireland would leave the business on May 15. The group, which also trades as Screwfix in Britain and Castorama and Brico Depot in France, also plans to close a few loss-making stores in Europe, develop unified garden and bathroom businesses and start a revitalisation programme for its big stores across Europe. Kingfisher made a pretax profit of 675 million pounds in the year to Jan. 31. That was in line with analysts’ average forecast of 674 million pounds but down from 744 million a year earlier. The fall in profit reflected a slower market in France since the summer of 2014, 34 million pounds of adverse foreign exchange movements on the translation of non-sterling profits and 22 million pounds in charges for new country development activity. Sales rose 2.9 percent on a constant currency basis to 10.97 billion pounds. Kingfisher ended the year with net cash of 329 million pounds and is paying a dividend of 10 pence a share, up 1 percent. It also plans to return a further 200 million pounds to investors during the 2015-16 year. Shares in Kingfisher, the world’s No. 3 DIY player behind U.S. groups Lowe’s (LOW.N) and Home Depot (HD.N), have fallen 12 percent over the last year. They closed at 364.8 pence on Monday, valuing the business at 8.54 billion pounds. On Monday, Kingfisher’s proposed 275 million euro purchase of small French rival Mr Bricolage (MBRI.PA) collapsed. 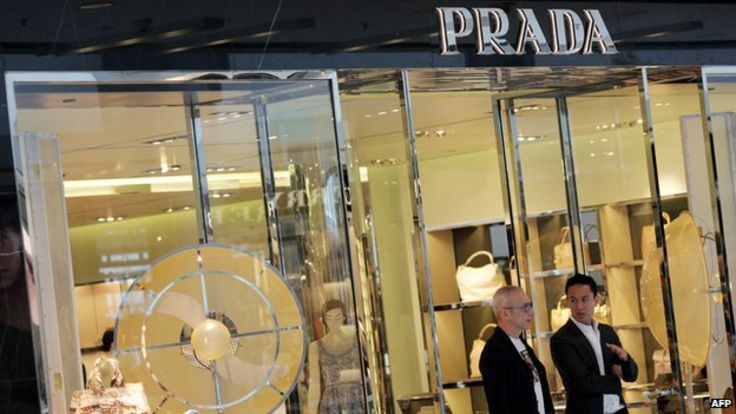 Italian luxury goods retailer Prada saw its net profit fall 28% last year as sales slumped in major markets of China and Europe. The firm’s net income was €451m ($490m; £330m) for the year ending 31 January, down from €628m a year ago. The amount also fell short of analyst expectations of €476m. Its Asian sales fell 3% in the time period with much of the decline coming from the Hong Kong and Macau markets. “Results in the region were hit by the negative performances recorded in Hong Kong and Macau,” Prada said in a statement on Monday. The Asia-Pacific region accounts for more than a third – over 35% – of the group’s sales, making it Prada’s biggest market. A combination of a clampdown on corruption by the Chinese government, and pro-democracy protests closing down major roads in Hong Kong, leading to the decline in the number of mainland Chinese tourists, has led to several retailers reporting a slump in sales. In other major markets like Europe, Prada sales fell nearly 5%. The losses were given a boost by sales growing slightly in North America and Japan, where sales jumped nearly 8%. The company has said that it would have to cut costs and open fewer stores than they had planned because of the results. He was also questioned about the company’s use of zero hours contracts. Sports Direct employs nearly 15,000 on terms that guarantee no set hours each week. Mr Hellawell claimed that Sports Direct uses the contracts no more than any other retailer, but data from the Office for National Statistics (ONS) appears to cast doubt on this. ONS figures show that from October to December 2014, just 1.8 per cent of people working in retail and wholesale were on zero-hours contracts. This indicates that 72,000 are employed in the sector on the contracts, with one in five working at Sports Direct. The Scottish Affairs Select Committee, which was questioning Mr Hellawell, also heard from Philip Duffy, joint administrator for USC. The firm was previously owned by Sports Direct and was sold back to Sports Direct in a pre-pack administration, wiping out the company’s debts. Mr Duffy claimed that his company, Duff & Phelps, attempted to encourage Sports Direct to begin a consultation period with its staff but were ignored, and were forced to “consult” with staff themselves but with only 15 minutes’ notice. USC, which traded as West Coast Capital, was issued with a winding-up order in early December by Diesel, over money it was owed for stock. Mr Duffy told MPs that 95 per cent of companies issued with such orders do not survive. Mr Poulter said such evidence could be used in a tribunal hearing to strengthen a case for consultation to have started sooner. The normal minimum consultation period is 30 days before dismissals take effect. The Benetton family has sold its controlling stake in World Duty Free to Switzerland’s Dufry. The deal creates the world largest travel retailer, with a market share of 25% and projected annual sales of $9bn (€8.3bn; £6bn). Dufry is paying €10.25 a share for the 50.1% stake, valuing the group at €3.6bn. 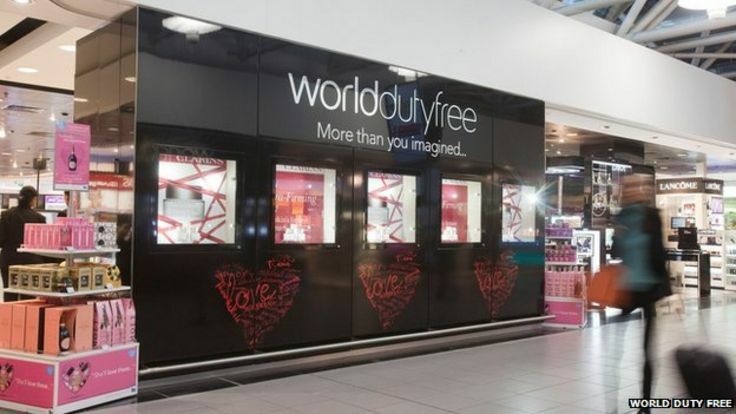 World Duty Free operates 495 stores in 98 airports, including London’s Heathrow and Gatwick. Based in Basel, Dufry has 1,650 stores in more than 60 countries with around 20,000 employees. Last year it made a record turnover of $4.3bn. That compares to World Duty Free’s turnover of $2.6bn, currently owned by Edizione, the holding company of the Benetton family. Retail spending at airports is expected to rise in the years ahead, particularly in Asia where more than 350 new airports are set to be built. Further details on the transaction are expected on Monday. 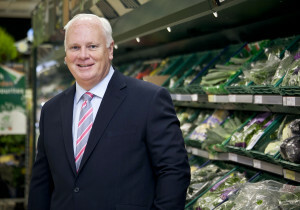 Andrew Yaxley has been announced as the new CEO of Tesco Ireland. Yaxley (47) is currently the managing director of Tesco’s London business. Prior to that he held a number of positions in the commercial function as a member of the UK leadership team leading the Fresh and Packaged Food Divisions, and the Commercial business in Slovakia and Czech Republic. He succeeds Phil J Clarke, who has held the position of chief executive of Tesco Ireland for the past two years and will retire in April. 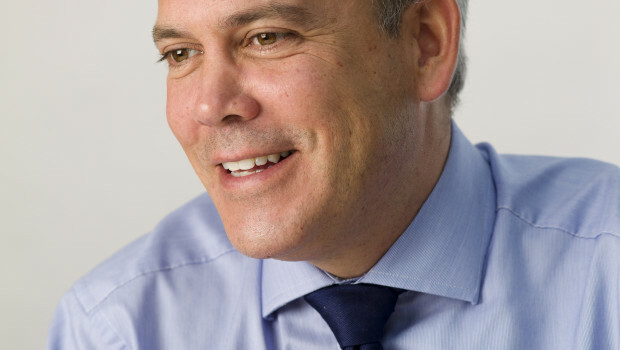 According to Dave Lewis, Group CEO, Clarke has had an exemplary career with Tesco. Yaxley joined Tesco in 2001 having previously worked for Mars. He is from Derbyshire. Halfords Group on Monday announced the appointment of Jill McDonald as chief executive, with effect of 11th May. The current CEO, UK and president of North West Europe for McDonald’s Corporation, McDonald also counts Colgate Palmolive and British Airways in her resume. McDonald will be just one of a handful of female chief executives for retail companies in the UK, replacing Matt Davies, who leaves in June for Tesco. Halfords also noted that it will report on its preliminary results for the 53 weeks to 3rd April on 5th June. Alid is planning to open more new shops in the UK this year than Tesco, Sainsbury’s and Morrisons combined according to comprehensive new supermarket research that lays bare the dramatic changes in the industry. The German discounter, which celebrates its 25th anniversary of opening in the UK this year, plans to open 1.02m sq ft of shop space in 2015, the equivalent of roughly 60 shops. This compares to just 450,000 sq ft for Sainsbury’s, 220,000 sq ft for Morrisons, and is almost ten times more than the 170,000 sq ft Tesco intends to open. The findings from IPD, the commercial property industry’s leading research body, and Colliers, the property agent, show how the grocery industry has been turned on its head by the rise of the discounters and a slump in sales for the “big four”, which includes Asda as well as Tesco, Sainsbury’s and Morrisons. The “big four” have expanded rapidly over the last two decades but have been forced to scrap new store openings to shore up their battered balance sheets. Tesco announced earlier this year that it was scrapping 49 stores as new chief executive Dave Lewis responded to a fall in sales and the discovery of a £263m blackhole in retailer’s accounts. The search shows that the amount of space Tesco will open this year is down 76pc on 2014. In contrast, the German discounter Aldi, which now has more than 500 shops in the UK, is ramping up its expansion plans as it grows market share. After Aldi, Marks & Spencer has the most ambitious store opening plans and intends to open 600,000 sq ft of space. Asda plans to open 550,000 sq ft while Aldi’s rival Lidl wants to open 340,000 sq ft, double the amount of Tesco. Overall, 3.9m sq ft of space is due to be added to Britain’s grocery industry this year. However, in a shift from recent patterns, just 29pc of this will be traditional supermarkets. Instead, 54pc will be small supermarkets of between 3,000 sq ft and 15,000 sq ft, which is Aldi’s favoured size, while 17pc will be convenience stores such as Tesco Express and Sainsbury’s Local. James Watson, head of UK investment at Colliers, said the grocery industry has “rebooted itself” as the biggest chains look to fightback against a change in consumer habits towards smaller and more frequent shops rather than one weekly trip to an out-of-town supermarket. The report also highlights that Britain’s pension funds could take a hit from the pressure on the industry because they own supermarkets across the UK. In 2014, 86pc of all the supermarkets bought were by UK institutions such as pension funds, which is in line with the historical average. The value of supermarkets is now under pressure as the profitability of the industry falls and demand to develop new sites slows. The value of supermarkets bought and sold in the UK dropped by 27pc year-on-year during 2014 to £1.3bn. The report said there was £500m of deals in the second quarter of the year but then the “depth of problems facing the operators became increasingly obvious”. Mr Watson the industry was likely to become split between prime and secondary supermarkets, with stores in the busy locations still likely to perform robustly. He said: “Operator difficulties are being offset by an improving economic situation and a more constrained supply of new supermarket assets. Ashapura Intimates Fashion plans to open 200 Valentine loungewear retail showrooms across India in three years on a franchise basis. It plans to open 26 Valentine showrooms in Mumbai this year, most of which will be company-owned, it said in a statement on Monday. Ashapura sells intimate garments such as lounge wear, bridal night wear, honeymoon sets, bathrobes, nightwear, relax-wear and sportswear. The Bharatiya Janata Party (BJP)-led government in the Indian state of Maharashtra on Friday signed a memorandum of understanding (MoU) with the Swedish furniture retailing giant, IKEA, to set up two to three stores. Maharashtra is one of four states, including Telangana, Karnataka and Delhi-National Capital Region (NCR), identified by IKEA to open its stores. One store will need more than eight acres (350,000 square feet). The company is on the lookout for locations in these states. Swedish fashion retailer H&M said on Monday that sales including value-added tax (VAT) rose 15 percent in local currencies in February 2015 compared to the same month the previous year. In the first quarter from 1 December 2014 to 28 February 2015, sales jumped 15 percent including VAT in local currencies compared to the corresponding quarter last year. Sales in the first quarter converted into Swedish Krona grew 25 percent to SEK46.79 billon (USD5.41b) including VAT. Sales excluding VAT amounted to SEK 40.28b. The total number of stores amounted to 3,551 on 28 February 2015 versus 3,192 on 28 February 2014. German discounter Aldi is planning to launch an online store in Britain, according to reports. The retailer, which has long avoided online sales as it is not profitable enough, has offered online delivery of alcoholic drinks in Australia since 2013 but the UK launch would be its first foray into ecommerce in Europe. Aldi South declined to comment on the article beyond saying the German holding group was not currently planning any online trade, referring queries about Britain to the unit there, which was not immediately available to comment. Aldi, the world’s biggest discount chain, and rival Lidl have been expanding rapidly in Britain, stealing market share from incumbents Tesco, Asda, Sainsbury’s and Morrisons. Last month Aldi revealed plans to open more than 70 new stores and recruit almost 5,000 staff in Britain this year. The scheme will add to its current 560 outlets in the country, pushing its portfolio of stores past 600. All four incumbents are competing fiercely for a share of the rapidly growing grocery ecommerce market, with Morrisons the last to go online when it struck a deal with Ocado last year. Grocery ecommerce is more advanced in Britain than elsewhere in Europe, already accounting for about 5pc of sales. Online grocery sales will roughly double from 2012 to 2016 in five major northern European markets – Britain, France, Germany, Switzerland and the Netherlands – the food and consumer goods research group IGD forecasts. REWE, Germany’s second-biggest supermarket group, said earlier this month it was investing heavily in grocery ecommerce even though it does not expect to turn a profit soon, as it braces for Amazon to expand its food delivery service. Complex logistics for fresh and frozen produce means it is hard to make online grocery profitable, particularly for retailers selling cut-price goods like those on offer at Aldi. Home and garden retailer Homebase has announced the appointment of Echo Lu as managing director of the company. Lu, who is set to take up her new position on April 20, joins the company from Tesco where she worked over the past 10 years across different markets, including group business planning & insight director and property director for UK & Ireland. Prior to that, Lu also held a number of roles in Tesco’s Asian business, including chief operating officer for China, operations director East China and commercial buying for grocery. John Walden, chief executive at Home Retail Group, which owns Homebase, said: “Echo has significant, broad-based retail experience both in the UK and the rapidly evolving Asian region, and importantly has been an agent for positive change throughout her career. The Asia regional head of Dubai-based Al-Futtaim Group has said Singapore has too many malls that are too similar to each other. Al-Futtaim announced last week that it will close two John Little stores and a Marks and Spencer outlet in Singapore in the coming months. Kesri Kapur, Al-Futtaim’s head of business in Asia, told The Malay Mail that Singapore’s retail sector is unsustainable as it stands as it has too many shopping malls that are similar to one another. “I personally believe that Singapore is ‘over-retail’. There are far too many stores, far too many malls in Singapore and not enough shoppers – and these are similar types of stores,” he said Kapur. “There is not enough differentiation in the stores. For such a small market, if it’s to be viable in the longer-term and sustainable, there has to be some differentiation (among) the stores,” he added. Kapur said the closures were part of a consolidation plan and that none of the employees in the stores would be laid off, and will instead be redeployed to other stores or roles within the conglomerate. He said consumers are going online more for shopping and in response to this, Al-Futtaim will launch its e-commerce offering later this year. “It’s not just a cost cutting exercise for us. Operational efficiency and customer engagement are important, but customer engagement happens when they see something new either in terms of distribution channel or the type of products that we’re selling… it’s our intention to make (it) as convenient as possible for the consumers,” Kapur told The Malay Mail. Arcadia’s flagship brands Topshop and Topman has opened its first flagship in Auckland, New Zealand, after Top Retail, a company founded by fashion designer Karen Walker, menswear retailer Barkers, and a third, silent partner, secured the rights to own, develop and operate the brands in the country. The 10,000 square foot, two-floor flagship on Queen Street, Auckland, opened last week to hundreds of anticipated shoppers, some of which had waited 12 hours to be the first inside the store that will be receiving 300 new styles per week. Walker’s Auckland boutique department store, The Department Store, has been stocking Topshop and Topman items for the past five years, but this marks a major development in the expansion of the brand in the country, with reports suggesting that additional sites in Wellington and Christchurch are currently being considered. Inditex, the Spanish owner of fast fashion retailer Zara, has announced net profits for its fiscal 2014 of just over €2.5 billion, a five per cent rise year-on-year. Net sales were up eight per cent to €18.1 billion, from €16.7 billion in 2013, and although gross profit was up seven per cent to €10.6 billion, the company’s gross margin slipped somewhat to 58.3 per cent from 59.3 per cent in the previous year. Inditex also announced plans for a profit share scheme over the next two years for any group employees who have been with the company for at least two years, which amounts to some 70,000 of Inditex’s 137,000 staff. Inditex opened 343 stores in the 54 markets it operates within, resulting in a new total of 6,683 locations across its store network. The fashion group launched new ecommerce platforms in Mexico and South Korea last year, to increase its reach to 27 markets and it plans to launch into smaller Asian markets such as Hong Kong, Macau and Taiwan during 2015. Lifestyle clothing brand Joules saw its full year revenue climb by 21.3% to £96.3 million as it continued to expand in the UK and overseas. In the year to 25 May 2014, pre-tax profit before exceptional items grew by 23.3% to £5.1 million. Retail sales from Joules own stores increased by 36% with ecommerce and catalogue sales rising by the same percentage as online trade was boosted by the company’s new click and collect service. Meanwhile, Joules saw strong growth in its international sales particularly in the USA and Germany. Wholesale sales rose by 5%. During the year, Joules opened 19 new stores to take the total to 85 at the year end. In addition, the company has opened a further 14 stores in the year to date. Joules continued to invest in its infrastructure in the year to support its long term growth plans. This included the installation of a new epos system in stores, a new warehouse management system to accommodate additional volumes, and enhancements to the online proposition. The company also expanded its product categories with the launch of a new eyewear range with eyewear specialist Mondottica. Joules founder and chief executive Tom Joule said: “This was an exceptional period for the business as we continued to deliver strong progress against our strategy of developing Joules as an international lifestyle brand. “We remain resolutely focused on carefully growing Joules in the UK and internationally whilst ensuring the brand remains loved by existing customers and attracting new ones. This has resulted in strong growth across all of the brand’s distribution channels. Italian luxury house Prada opened two new stores in Asia last week – one in Hong Kong, one in South Korea. Opened on 2 March, the new Seoul store is located at the Shinsegae Main department store, covering a total area of approximately 165 square metres and housing the men’s ready-to-wear, leather goods, accessories and footwear collections. Located at Plaza 2000 Building on Causeway Bay’s Russell Street, the Hong Kong store covers a total area of 1,320 square metres. Opened on 5 March, it’s the ninth Prada store in the city. The luxury brand last month opened its first store in Vietnam, at Hanoi’s prestigious shopping district. Burberry on Monday opened its first freestanding store in Shinsaibashi, Osaka. Set over two floors, the new store houses the largest Burberry product assortment in Osaka, including the brand’s collection of iconic Made in England trench coats. In-store digital screens showcase Burberry content and broadcast live events directly from the brand’s global headquarters in London, enabled by the Burberry retail theatre concept. A collection of men’s and women’s accessories has been designed exclusively for the Burberry Osaka store to celebrate the opening. The collection includes limited edition versions of key Burberry bag styles – The Mini Bee bag and The Petal bag for women, all available in store. 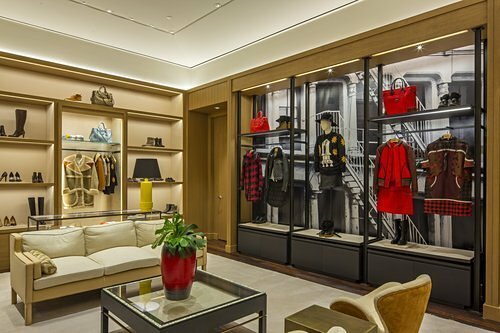 Burberry has a long-term commitment to Japan where it currently has four mainline stores and thirteen concessions in locations including Omotesando, Kobe, Ginza Marronnier Dori and Roppongi. Leading lingerie and beauty retailer Victoria’s Secret has opened its first Beauty & Accessories store at AB Won Pat Guam International Airport, in partnership with Lotte Duty Free Guam. Opened on 11 March, the new store showcases an array of fashion-forward beauty products and accessories designed for the modern jet-setter, according to the brand. The offer includes prestige fragrances such as the FiFi Award-winning Victoria’s Secret Bombshell, the newly launched Bombshell Pink Diamonds and perennial favourites such as VS Fantasies. These are complemented by travel-friendly items such as lip glosses and body care products. The new Guam location also carries a range of “functional yet chic” accessories, including branded cosmetic cases, multi-use fashion bags, scarves, sunglasses and underwear. McIlroy is set to be joined by many of world golf’s big names, with Rickie Fowler, Ernie Els, Sergio Garcia and Lee Westwood already confirmed to join Ireland’s golfing superstars McIlroy, Graeme McDowell, Padraig Harrington and Ryder Cup Captain Darren Clarke. One of the world’s leading airport retailers with a turnover of US$1.9 billion in 2014, Dubai Duty Free is already associated with The European Tour as sponsors of the DP World Tour Championship and the Omega Dubai Desert Classic, won at the Emirates Golf Club this year by McIlroy. Dubai Duty Free’s golf portfolio also includes the Dubai Ladies Masters, as well as a series of high-profile events including the annual Dubai Duty Free Golf World Cup, Dubai Duty Free UAE Nationals Cup, Dubai Duty Free Golf Cup and Dubai Irish Golf Society tournament. The retailer has many other connections to sport. Dubai Duty Free owns and stages the Dubai Duty Free Tennis Championships, which reaches a global audience of over 400 million TV viewers and generates media exposure of US$718 million. A keen supporter of horseracing, the operation is probably best known in Ireland for its sponsorship of the Dubai Duty Free Irish Derby, one of Ireland’s most prestigious races which is held at the Curragh Racecourse in June. This year marks the 150th running of the historic race. The company also sponsors the Dubai Duty Free Shergar Cup at Ascot and Dubai Duty Free Spring Trials and Dubai Duty Free International Raceday at Newbury. Dubai Duty Free Executive Vice Chairman Colm McLoughlin said: “Sports sponsorship plays a huge role in our overall marketing strategy, it fosters goodwill and allows our brand to travel all around the globe. The European Tour Chief Executive George O’Grady said: “We are delighted to welcome Dubai Duty Free as a title sponsor on The European Tour and look forward to expanding our partnership with another powerful global brand which has vast experience in the sports sponsorship market. THE little-known new owners of BHS have spoken out for the first time to reveal their ambitious plans to turn around the department store chain, claiming it is a “very big challenge” and will take “at least two years” to get it back into profit. Keith Smith, chairman of the vehicle that has bought BHS, told The Sunday Telegraph that the “biggest challenge” facing the retailer was its estimated pension deficit of more than £100m, but insisted they had a “credible plan” to fund it. Mr Smith said Retail Acquisitions Limited had “mutually agreed” a deal with Sir Philip Green whereby they would both top up the pension fund with annual payments in each of the next three years. The new owner of BHS will meet pension trustees and the Pensions Regulator this week to discuss their plans for the deficit. As well as annual top-ups, the consortium could sell off property to raise funds. The retail industry was shocked last week when Sir Philip, one of Britain’s best known businessmen, sold loss-making BHS to a little-known collection of financiers, lawyers, and accountants. The consortium paid a nominal £1 for BHS and the department store group’s debts were written off by Sir Philip. Mr Smith, a 76-year-old former broker, said the group was being backed by a collection of “less than 10” private individuals and small corporates, all of whom are thought to be British. However, the deal “had not happened overnight”, he said, and the group had been in negotiations for more than a year. Mr Smith said Sir Philip was made aware of the group after he was introduced to Dominic Chappell, a key member of the consortium and a former racing driver, by a mutual friend based in Monaco. BHS has an estimated £90m of cash on the balance sheet for Retail Acquisitions to use as funding. This is split roughly half and half between cash left in BHS by Sir Philip and funding provided by the consortium, according to Mr Smith. Mr Smith said he had known the accountants in the group for 30 years and had also previously worked with the lawyers, who include Eddie Parladorio, an adviser to celebrities. The deal also involved a commitment from Retail Acquisitions to put any funds raised from asset sales back into the retailer, reducing the prospects of BHS being asset-stripped. The retailer’s property portfolio is estimated to be worth between £100m and £200m. BHS has 171 stores and 11,000 staff. The retailer was founded in 1928 in Brixton and went on to become one of the best-known brands on the high street. The deal has led to industry analysts questioning how a little-known group of investors can do a better job of running BHS than Sir Philip, a veteran of the industry who also controls Arcadia, owner of Topshop. Mr Smith said BHS was split between profitable and loss-making stores. “We have got to create a situation where all the stores are receiving the right stock and footfall, he said. World famous luxury department store Harvey Nichols will make its debut in Qatar after signing a deal to be part of Doha Festival City, it was announced on Saturday. Qatari firm Saleh Al Hamad Al Mana Group of Companies has struck an exclusive licence agreement with Harvey Nichols to bring it to the Gulf state. The mall is already well under construction, and on programme for opening in the third quarter of 2016. “Bringing one of the world’s most highly renowned department stores to Qatar for the first time is a significant milestone for Doha Festival City as it will meet and satisfy the country’s sophisticated taste and appetite for luxury goods,” added Kareem M Shamma, CEO of BASREC, the joint venture which comprises Dubai-based Al Futtaim Real Estate Services, Qatar Islamic Bank, Aqar Real Estate Investment Company and a private Qatari investor. “Of the 550 shops including more than 100 restaurants, cafes and food court outlets at Doha Festival City Mall, a large number of brands will be making their debut in the Qatari market. This will make our mall one of the region’s leading shopping destinations and it will become a destination of choice for all of Qatar’s residents and visitors,” he said. Harvey Nichols opened its first store in London in 1831 on the corner of Knightsbridge and Sloane Street, and remains one of the most glamorous department stores in the world. Hisham Saleh Al Mana, chairman of Saleh Al Hamad Al Mana Group of Companies, confirmed plans for the three-level 112,000 square foot store. “We are partnering with Doha Festival City Mall in bringing Harvey Nichols, one of the most prestigious retail stores, to Qatar and this is the ideal location to host such an iconic British institution. Qatar will be hosting the FIFA 2022 World Cup and will be paving the way as the center of attraction in the region,” he said. Last May, Doha Festival City announced the appointment of Gulf Contracting Company and ALEC Qatar, a joint venture to lead construction of the massive mall. The struggling chain also highlighted another year of falling sales as underlying profits – excluding the £1.3 billion one-off property hit – fell 52% to £345 million in the year to February 1. It announced that it will close 23 under-performing M Local stores during the current financial year, having recently disclosed plans to shut 10 smaller supermarket this year. The results come days before new chief executive David Potts, who has more than 40 years retailing experience at Tesco, takes his post. Mr Potts replaces former boss Dalton Philips, who was ousted a year after the announcement of a three-year £1 billion programme to cut prices to fight the supermarket price war. Mr Phillips had led the retailer since 2010. Like-for-like sales were down 5.9% across the year but the trend in the final quarter showed signs of improvement with a decline of 2.6%. Morrisons said consumer confidence has started to recover but with real disposable incomes still short of pre-2008 levels the chain said customers are unlikely to return to old shopping habits in the near term. The property write-down stems from the company’s assessment of every store’s recoverable amount compared to its book value. Stripping out the one-off item, the profits performance was broadly in line with City expectations. It increased its total dividend payment by 5% to 13.65p a share but warned that its commitment for this year was to pay “not less than 5p a share”. Richard Hunter, head of equities at Hargreaves Lansdown Stockbrokers, said: “The numbers make for some generally uncomfortable reading, although there are signs that the turnaround plan is gaining traction. Total turnover during the period was £16.8 billion, a fall of 4.9% year-on-year. Mr Potts, who starts his new job on Monday, is the former boss of Tesco’s Asia operation, but left the group in 2011 after losing out to Philip Clarke as successor to long-time boss Sir Terry Leahy. Sir Philip Green has sold department store chain BHS to an investment vehicle called Retail Acquisitions Ltd. The BBC understands the asking price for BHS was as low as £1. BHS was part of the Arcadia Group, controlled by Sir Philip, which still includes TopShop, Burton and Evans. The company was sold debt free, but one of the issues hampering deals has been the losses made by the chain. In 2013, it lost £69.6m on £675.7m of sales, down 3.5% on the previous year. Founded in 1928 in London’s Brixton, BHS has 180 stores and employs almost 12,000 staff. Control of BHS will pass over today, Arcadia Group said in a statement. 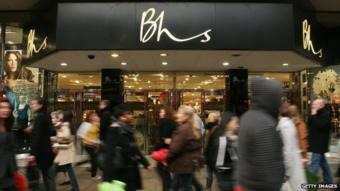 Sir Philip said: “I am pleased that we have found a buyer in Retail Acquisitions Ltd who wants to develop the BHS brand. Retail Acquisitions Ltd was set up last year to try to push through this deal, but may look to make more acquisitions in the future. The firm is backed by a number of investors including brokers and lawyers. The company directors are former Formula 3000 racing driver and entrepreneur Dominic Chappell, former City finance house Nabarro Wells director Keith Smith, lawyer Edward Parladorio, and Lennart Henningson, a former senior advisor for HSN Nord Bank. The firm plans to keep the BHS management structure in place, and will appoint a new chairman in due course. BBC Business editor Kamal Ahmed understands that former Thomas Cook chief executive Harriet Green was approached to be the new BHS chair, but has declined the offer. “The question for the new owners of BHS – and they are a pretty obscure bunch for the moment – is whether they can breathe new life into what has become a pretty dowdy constituent of the high street,” he added. Keith Smith, who was made the chairman of Retail Acquisitions Ltd on Thursday, said: “This is a fantastic opportunity to breathe new life into this iconic British high street brand. Joshua Raymond, chief market strategist at broker City Index, said Retail Acquisitions Ltd faces a “monumental” challenge in trying to turn around the fortunes of BHS. Retail analyst Richard Hyman, of the richardtalksretail website, said that the decision to sell “will have been as close to painful for [Sir] Philip as any business decision will ever be”. “His purchase of the brand was a master stroke. “He saw value and restructuring potential which allowed him to go on and buy Arcadia and try to buy M&S too,” Mr Hyman said. Sir Philip Green has sold loss-making high street chain BHS to a retail vehicle for an undisclosed sum. The tycoon, who owned the department store business for almost 15 years, had put it up for sale earlier this year after receiving a number of approaches. Qatar plans to open the world’s first open-air, air conditioned public plaza, it was announced this week. The 38,000 sq m project at Doha’s Katara Cultural Village is intended to open in 2016, with a Galeries Lafayette department store, dedicated children’s mall and Evian branded spa. Ground-cooling technology will enable shoppers to wander around the plaza even in the hottest months of the year, the project’s directors told a press conference in Doha. The Katara Cultural Foundation manages a range of projects and facilities at Katara Village, including museums, restaurants, concerts, an opera house and several arts and culture festivals throughout the year. It is also overseeing the development of a luxury villa development nearby, called Katara Hills. However, Katara Plaza will be its first commercial retail project. Dr Khalid bin Ibrahim Al-Sulaiti, general manager of Katara Cultural Foundation, told assembled press the intention is to use profits from the scheme to maintain the cultural activities on offer at the village. The state-backed organisation has partnered with retail distribution company Ali Bin Ali Group to secure tenants for the scheme. Among the deals already inked are with anchor tenant, French department store Galeries Lafayette, which has signed to take more than 13,800 sq m of space dedicated for fashion retail. The intention is to select exclusive fashion brands over chain retailers, Nabeel Ali Bin Ali, vice-chairman of Ali Bin Ali Group told assembled press at Katata Hall. Meanwhile, mineral water producer Evian has signed to develop a branded spa at the plaza, and there will also be a large children’s mall designed in the shape of a wrapped present. Paris-based architect Bruno Moinard has been appointed to design the scheme, and said it will combine classical Roman architecture – columns, arches and the trademark horseshoe plaza shape (pictured) – with traditional Arabic building styles. Katara Cultural Village has attracted up to one million visitors from across the world each year since it opened in 2010. It is hoped that the planned opening of the commercial plaza will significantly increase these numbers by establishing Doha as an international centre for arts, retail and culture. However, Al-Sulaiti told Arabian Business the foundation’s underlying aim is to celebrate Qatar’s heritage, and it would seek to ensure the new commercial plaza was accessible and affordable to local residents as well as tourists. Google is following Microsoft and Apple into the retail space with its first-ever “shop in shop” in the UK. The search giant on Wednesday unveiled the shop within a shop on London’s Tottenham Court Road, traditionally a center of technology stores for the UK’s capital. The store, which will be housed within retailer Currys PC World, will provide a range of Android and Chrome OS products, as well as the Chromecast streaming dongle, to educate customers on the many products running Google’s platforms. The Google shop follows a concept similar to that of Apple’s retail stores. Customers will be able to comb through the store to test out devices and software, as well as attend classes and events that teach them how to use the products. Google also envisions hosting “Virtual Space Camps” for kids to learn the basics of coding. Although Google has lived its life largely online and has a Web-based marketplace, called Google Play, where it sells products, the company has been rumored to be working on retail stores for years. In 2013, for example, a report surfaced suggesting that Google would open retail stores across the US in major metropolitan areas. After that failed to happen (and Google said that it had no interest in “being a retailer”), yet more reports surfaced, saying that Google’s mysterious floating barges might be converted to retail space for the company. Again, that didn’t happen. Now that Google has a physical presence, one could be forgiven for wondering whether this is the first of a much broader focus on physical retail, given the success its chief mobile rival, Apple, is having in the bricks-and-mortar realm. At his company’s press event on Monday, Apple CEO Tim Cook said that Apple now has 453 stores worldwide and that over 120 million customers came to those stores in the fourth quarter alone. Apple doesn’t break out its retail store revenue any longer, but those venues are believed to be generating billions of dollars for the company each quarter. And the very fact that Apple has continuously expanded its retail footprint worldwide suggests those stores are greatly benefiting the company. Google seems to see the same value in retail. In a statement Wednesday, Google’s UK marketing director James Elias said that retail is still a must-have experience for many buyers. Looking ahead, Google says that it will open two more “shop in shop” stores in the UK later this year. The company didn’t say whether any standalone stores will follow. 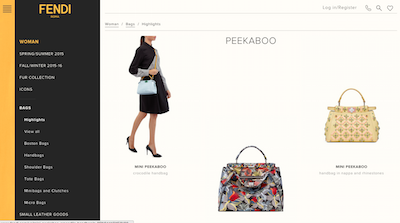 Italian fashion house Fendi is updating its online image with a new Web site that streamlines navigation and caters to consumers’ needs. The brand has released a new ecommerce feature for its European sites, and the Web site redesign was likely in preparation for this addition. 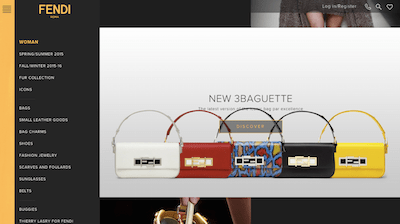 By staying up-to-date on the latest technology, Fendi is ensuring its consumers that it is committed to making their online experience as enjoyable as possible. “The new site has plenty of gorgeous imagery, videos and some nice interactions,” said Fadi Shuman, co-founder of Born Group, New York. “There is a lovely simplicity to it which at the same time feels modern. “The new Fendi site has taken the more classic left-hand navigation approach, which isn’t as common as it used to be,” he said. “I actually think this helps to lend the site a more a authentic tone where they’re not trying too hard be the edgiest and most innovative. Mr. Shuman is not affiliated with Fendi, but agreed to comment as an industry expert. Fendi was unable to respond by press deadline. 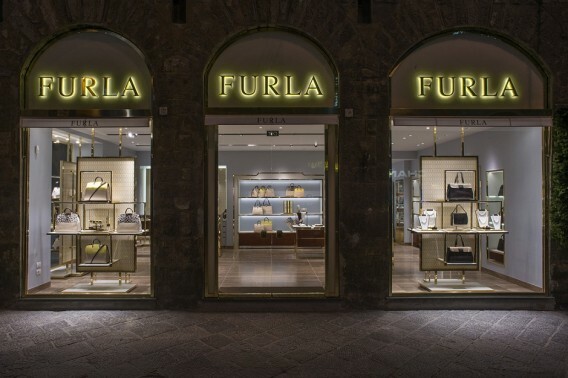 Fendi has kept its consumers informed about its upcoming ecommerce feature. At the beginning of the year the Italian fashion house announced that it will soon offer global ecommerce after an inital launch in Europe. Fendi’s CEO Pietro Beccari told Women’s Wear Daily of the impending launch moments before the runway presentation of the brand’s menswear began in Paris. Offering ecommerce extends a label’s reach beyond the traditional retail radius and allows the consumer to interact with the brand how they feel most comfortable (see story). Fendi’s new Web site features a yellow menu in its signature color on the left side of the page. The menu lists options such as “woman,” “man,” “kids,” “the magic of Fendi,” “casa,” which refers to housewares, and others. 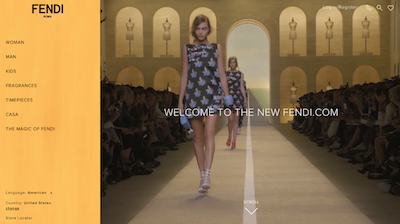 The homepage opens on a video clip of the latest fashion show with models walking down the runway and the words, “welcome to the new Fendi.com” written in white across the center of the screen. Users are then given the option to scroll down to experience more of the site. Some of the features available include the option to watch a full video recording of the fashion show or to participate in the online auction of Fendi’s 3Baguette Project in which celebrities design their own versions of the classic Fendi Baguette bag. While the ecommerce feature has not yet been released in the United States, consumers do have the opportunity to view the different collections online. Perhaps the most unique element of the site is the “magic of Fendi” section, which offers information on the history of the brand, custom orders and Fendi’s public works project to restore Rome’s fountains. This gives users a chance to see a more intimate side of the brand and form a more substantial connection. The previous Web site did not include all of this information but rather linked to microsites that shared the content individually. By uniting its content under one site, Fendi is making navigation easier for consumers and improving their experience of the brand. Other Italian fashion labels have also been updating their online presence. For example, Marni amplified the efforts for its 20th anniversary with a new Web site design that blends content and commerce. Marni worked with Yoox Group, which has powered its ecommerce since its launch in 2006, to improve the user experience with a new image-lead layout that encourages brand discovery. As Marni continues to commemorate its milestone, having a Web site where consumers can easily explore past projects and brand history will help get consumers involved in the celebration (see story). 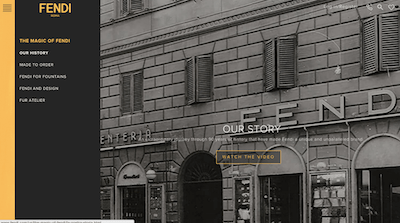 Fendi’s new Web site will certainly help the brand keep up with its competitors. It will also allow the brand to connect with consumers by providing them with an enjoyable online experience. “The advantages of having all aspects of the site integrated together on one site are huge,” Mr. Shuman said. “It means that brands can tell a story and engage their customers beyond singular conversation. “All brands must win a customer’s heart before they win their minds, and to do this they must create an emotional connection. This is done via all manner of content . “Unofficially, by April 25… we’ll aim to have inventory as soon as we get a hold of it. This should be on or around April 25,” said Omar Kassim, founder of online marketplace JadoPado.com. New York — Juicy Couture, which was acquired by Authentic Brands Group in 2013, may no longer be a coveted brand in the United States, but it is still has great appeal in foreign markets. The company expects to open 133 stores (through its various licensing partners) during the next five years, according to Women’s Wear Daily. Juicy will open 31 international locations in eight countries this year, the report said. Three of the countries — India, South Africa and Azerbaijan — will be new market entries for the brand. The majority of Dunnes Stores staff have voted for industrial action over work contracts and pay conditions. Members of Mandate Trade Union voted with a majority of 67% in favour of the industrial action on 6 March. Gerry Light, Mandate’s assistant general secretary said the nature and timing of industrial action will take place within the following week. Dunnes Stores workers have been involved in a long-running dispute with the company over the issue of zero hour contracts, fair pay and the right of representation for Dunnes Stores staff. Mandate said that banded hour contracts would give staff much-needed security. With banded hours, employees would be guaranteed a minimum number of hours of work each, which would enable them to apply for loans or mortgages. Dunnes Stores worker Cathy McLoughlin told the Irish Times that the management continues to refuse to enter into discussions with staff through their union, and says they won’t even go to the Labour Court to address their issues. She said: “None of us want to go on strike because we really can’t afford it, but what other option have we got? Our employer can stop the strike by simply agreeing to meet our union and we don’t feel that’s an unreasonable request. Last year, the Labour Court urged the company and the union to meet to resolve their differences. However Dunnes has still refused to enter into direct discussions with the union on any matter. 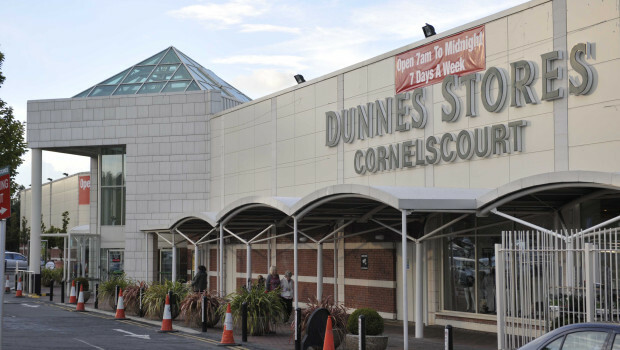 Dunnes Stores said at a time when the retail industry was fighting for survival, staff in the company had received two pay increases while it had also maintained employment levels. Dunnes has 112 branches across the Republic of Ireland with more than 10,000 workers – 4,000 of which are represented by the union. The American fashion house COACH is opening its first mono-brand store in France, in Fall. The new Coach store in Paris will be situated at 372-374 Rue Saint-Honoré and will cover a 6,500-square-foot space. Back in December, Coach only had 20 upgraded stores open across the globe, but the brand plans to open another 50 to 60 in 2015 — including the upcoming store in Paris. The Parisian COACH flagship store is developed under the new creative direction of Stuart Vevers and will feature a VIP salon, monogram services, a blackened steel and mahogany staircase, hand-tufted carpets, custom-designed cabinetry and vintage furniture. New Look is to open a flagship store at the eastern end of London’s Oxford Street. The fashion retailer has signed up to take a 31,800 square foot store at Great Portland Estates’ new development at 73/89 Oxford Street which is due to complete in April 2017. The store will include a basement, ground, first and second floors although the letting is conditional on GPE securing a change of use on the second floor from office to retail. GPE commenced the 90,500 square foot new-build development at 73/89 Oxford Street, which is directly opposite the Dean Street entrance to the Tottenham Court Road Crossrail station, earlier this year. The development is the latest in almost 600,000 square feet of schemes GPE is working on at the East End of Oxford Street, an area expected to benefit from significant regeneration ahead of Crossrail opening in 2018. John Lewis is to step into Singapore as part of plans to export to 15 countries over the next few years. The retailer, which is scheduled to reveal its annual profits and staff bonus on Thursday, has signed a deal to open concessions in two Robinsons department stores in the city-state in July. They will be run by Robinsons staff and mostly sell homewares under the John Lewis brand. Andy Street, chief executive of the British department store, said he expected to announce deals in up to five other countries this year. It follows a successful trial in South Korea with the Shinsegae department store, begun in 2012. John Lewis sheets, towels and tablecloths made at the groups’ Herbert Parkinson factory in Lancashire as well as other home accessories such as candles and picture frames are now sold in seven Shinsegae stores. The retailer recently invited representatives of international department stores to a showcase at its Peter Jones outlet in Sloane Square, London, in the hope of attracting new partners. Street said he hoped to be shipping John Lewis products wholesale to 15 countries “in the not too distant future”. Street said the push overseas was not a response to a tough UK market but an attempt to “seed” the John Lewis brand abroad for the long term. “Anybody taking their eye off the domestic ball at the moment would really regret it. We are not opening shops overseas and diverting management time. This is the icing on the cake,” he said. The department store’s parent group, the John Lewis Partnership, is expected to announce fall in annual profits of about 8% on 12 March despite benefiting from fast-growing online sales. In the first half of the group’s financial year, bumper profits at its department stores were offset by a fall at the Waitrose supermarket chain. Profits will also be affected by an extra holiday pay bill and increased pension contributions after an employment tribunal forced a change in the way all British companies calculate holiday pay. The group hands a share of its profits to staff. Last year, they were awarded a 15% bonus, equivalent to almost eight weeks’ pay but that was a drop on the 2013 payout of 17%. This year’s payout is expected to be smaller again. John Lewis remains on the expansion trail in the UK even as other major retailers, including Marks & Spencer, Tesco and Topshop owner Philip Green’s Arcadia Group have been closing stores. Street said John Lewis still had relatively few outlets and the city centres it was targeting would not die away as shopping destinations. Sea lions, submarines and enough space for 800 stores. That’s what the owners of the Mall of America in Minnesota are proposing for the American Dream mall in the Miami suburbs, which could some day be America’s biggest mall, according to the Miami Herald. The newspaper says the project is estimated to cost $4 billion, span 200 acres and employ more than 25,000 people. Dragon City, the new 115,000 sq m mall development, which is under construction in Bahrain, has pre-let more than 60 percent of space, according to Cluttons. Unlike conventional malls, Dragon City which is being built in the southwest corner of Diyar Al Muharraq City, will cater to both wholesale and retail consumer bases and is similar to the Dubai Dragon Mart concept. The mall design is infused with Chinese architectural and cultural aspects and will incorporate 750 retail store units with 4,500 sq m designated for warehouse space. Appointed by Chinamex, one of China’s largest overseas trading companies, Cluttons is the official leasing agent of the multi-million dollar retail project. It said in a statement that with an expected annual footfall of one to two million visitors, and retailers witnessing the success of Dragon Mart in the UAE, retail units are in high demand. Harry Goodson-Wickes, head of Cluttons Bahrain, said: “60 percent of units are now pre-let at Dragon City; a significant milestone in the development which is set to transform the retail landscape in Bahrain. We continue to record significant interest from a wide range of retailers and wholesalers looking to increase their presence or position themselves in the Bahrain market. Last week, developer Diyar Al Muharraq announced that the main structural framework of Dragon Mall and the Asian Dining Street in Dragon City has been completed. Dragon City is set to become a large scale trade platform for the direct sale of Chinese goods, with options for retail and wholesale opportunities and a tourist and entertainment site with Chinese architectural and cultural aspects. The facility will offer a variety of Chinese products such as home appliances, household items, building materials, furniture, toys, machinery, garments, textiles, footwear and general merchandise. The Sports Direct founder Mike Ashley has rebuffed MPs who wanted to grill him over the treatment of staff at the company’s USC retail business in Scotland and the use of zero-hours contracts. The billionaire told MPs it was more appropriate that chief executive David Foley attend the Scottish Affairs committee, which is conducting an investigation into how the business collapsed without any obligations to its staff. The committee wanted Ashley to answer questions about how around 200 staff at USC’s Ayrshire warehouse lost their jobs when administrators were called in to West Coast Capital (USC), a Sports Direct-controlled entity that owned 28 USC stores. The stores were immediately bought out of administration by another part of Sports Direct but the warehouse was abruptly closed down. Ian Davidson MP, the committee chairman, said he was satisfied that the company had agreed to put a senior executive in front of the committee, though he warned it retained the right to call Ashley if questions remained unanswered. “The hearing will be at the end of this month with the chief executive. We are still very concerned about the situation and want to conduct a thorough investigation,” he said. In a previous statement, Davidson described Ashley “as the directing influence of this group”. The committee is likely to be disappointed that the founder and chairman of the group has refused to attend. Davidson has the power to insist he come before MPs, but it is understood that with only a few weeks to go before parliament is dissolved ahead of the general election, he took the view that a legal battle was futile. The committee also wants to tackle Sports Direct’s use of zero-hours contracts following a previous investigation. As many as 90% of the retailer’s 23,000 staff are employed under the controversial terms, which do not guarantee work. Davidson has invited staff to come forward to discuss the impact of the contracts. Marks & Spencer, the British high street bellwether, is closing five of its Shanghai stores as it reshapes its Asian business. The retailer, which has previously identified China as a key overseas market for growth, said it will close five of its stores in Shanghai by August to “ensure it is best aligned with its strategic growth plans”. The company currently has 15 stores in China. Marks & Spencer said that it will continue to invest in its existing flagship store portfolio and modernise its flagship store on West Nanjing Road in Shanghai as well as having a “firm intent” to enter key Chinese cities such as Beijing and Guangzhou from 2015/2016. Marc Bolland, Marks & Spencer chief executive, has said that the retailer could find franchise partners to operate the Chinese stores or agree a wider joint venture with another retailer or investor to fund an expansion. The company said today that it is the “process of evaluating potential partners”. Marks & Spencer has had mixed success in Asia with store sales disappointing internal expectations, but recently enjoying a surge in online sales. The group said that it would continue its “bricks and clicks” strategy after internet sales increased by 200pc last year thanks to its popularity on Chinese websites such as TMall, a subsidiary of internet giant Alibaba. TMall accounts for 50pc of all clothing and footwear purchases made in China, providing international brands with a huge opportunity to reach China’s growing middle classes. Marks & Spencer signed up to TMall in December 2012. The group also said that it will invest in modernising its Hong Kong stores during this year and roll-out more of its standalone food stores. The retailer said it will open a 1,000 sq metre store in Macau’s Venetian Mall this November. “Last year, we reaffirmed our commitment to our Greater Chinese business and set out clear strategic plans. Today we can share more details of our continued investment across our priority markets of China, Hong Kong and Macau,” said Patrick Bousquet-Chavanne, Marks & Spencer’s executive director of marketing and international. It has also emerged that Marks and Spencer’s head of Asia has quit the business to take up a role at fashion brand Diesel. Bruce Findlay, regional director for Asia, follows the departure of M&S’s head of international business, Jan Heere, last year. Prada opened its first store in Vietnam, in the heart of Hoan Kiem, Hanoi’s prestigious shopping district. The space, designed by architect Roberto Baciocchi, covers a total area of 360 square metres on a single level and houses the women’s and men’s leather goods, accessories and footwear collections. The store is strategically located in one of Hanoi’s historic buildings overlooking the renowned August Revolution Square. White stone pillars and a series of windows and light boxes inserted into black marble volumes set the rhythm of the external façade. The entrance overlooking the square is enhanced by a large canopy extending over it. The interior comprises a succession of spaces, each featuring a different atmosphere. The area housing the women’s leather goods collection is defined by the signature black- and-white marble chequered flooring – a legacy of Prada’s identity worldwide – and green fabric-clad walls with cut-in niches exalting the display of the products. The area hosting women’s footwear is characterized by beige carpeting, green velvet sofas and walls with Prada’s iconic display niches. Benefit has launched a 1950s pop-up beauty parlour at 26 Greek Street, Soho to promote its Roller Lash mascara. The Curl’s Best Friend curl and cocktail bar, which will run for a month, is spread across three floors and is dedicated to embracing the ‘curl’. Designed by creative design agency The Persuaders, the venue allows visitors to relive 1950s beauty parlour indulgence and enjoy three theatrical floors of fun, glamour and pampering. On the ground floor there’s a bar serving cocktails and cupcakes. Guests can relax in Benefit’s lush vintage chairs for a gossip with the girls. Here they can try out the new Roller Lash mascara. Upstairs on the first floor is the beauty parlour and curl station. Floor two is the secret floor. As night falls, the Noir Bar bar serves cocktails from 7pm. The transformation of the building has been quite phenomenal, from the old Bay of Bengal restaurant with its wonky floors and crumbling floors. The Persuaders designed bespoke furniture pieces, lighting and art installations as well as finding and renovating vintage furniture. ‘This project has been like a wonderful creative treat to work on. Bringing the brand to life in such a creative way is a pure joy and to see people’s amazed faces and positive reactions as they walk in is the best compliment,’ says creative director, Andy McDonald. The store is backed up by the Curl’s Best Friend by Benefit app where girls can book beauty services, reserve bar tables, share photos and browse live newsfeeds. For those outside of London, Benefit’s Curls Best friend tour parlour will be hitting the road from 17 April 2015. THE Foschini Group aims to almost triple the number of its stores across the rest of Africa over the next five years, its chief executive said on Tuesday. Foschini is the biggest reseller of Adidas and Nike products in South Africa where it is the third-biggest clothing retailer by market value and operates more than 2,000 stores. It currently has about 130 outlets on the continent outside it home market, mostly in southern African countries including Namibia, Lesotho and Botswana. But CEO Doug Murray said the company planned to up that number to around 350 by 2020. “We are approaching Africa expansion as a long-term strategic project for the group,” he told the Reuters Africa Investment Summit. “We are not going to rush in at any cost,” he said. Mr Murray did not specify where the new stores would be opened, but said that Foschini wanted to enter the Kenyan market. Home to some of the world’s fastest-growing economies, sub-Saharan Africa is increasingly attracting interest from retail executives across the world. But tapping into that growth is difficult due to a shortage of the sort of prime retail space companies like Foschini favour in lucrative markets such as Nigeria. Mr Murray said congestion in ports and poor supply chain infrastructure, such as roads and warehouses, were hindering faster store roll-outs on the continent. “We found it was not easy to trade in Lagos when we opened our two stores there a few years ago. Getting our products from the ports to the stores is very difficult,” he said. This is despite Business Day reporting last year that GPI had opted to drastically cut back its Burger King store opening target from 100 by the end of June this year to just 60. The aggressive expansion was held back by the various approvals required by the respective municipalities to open Burger King outlets‚ as well as a strike-induced shortage of certain materials needed to kit out kitchens and serving areas. GPI CEO Alan Keet said on Monday, 2 March 2015, Burger King now operated 34 stores (mainly in Cape Town‚ Johannesburg and Durban) and would achieve the revised store target on schedule. While the local economy is soft Burger King openings have proved popular with SA’s burgeoning middle class and it is not unusual to see long queues outside certain outlets. Keet stressed that GPI was 100% happy with the margins being achieved‚ noting the operating margin at the end of December was about 56%. He was confident this could be fattened to about 60% in the medium term. The co-founder of Mahura Investments‚ Craig Gradidge‚ said it was prudent for GPI to hold back on the initial expansion plans. “As a long-term investor‚ I would rather the company gets the Burger King roll-out right and enjoys margin expansion. You don’t get these kinds of deals every day…. Keet said new roll-out plans favoured the opening of drive-through Burger King outlets‚ which can generate higher revenues than “inline” and food-court stores. He disclosed that GPI had set a target mix for 40% of its Burger King stores to be drive-through format. GPI’s interim results released on Friday showed Burger King more than tripled revenues to R134.5m‚ and showed a smaller operating loss of R27.6m (previously more than R40m). 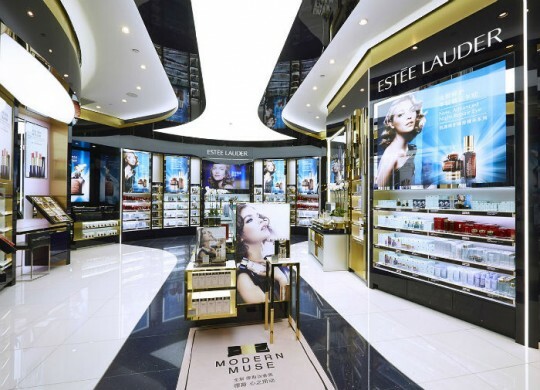 Estée Lauder has recently openened its largest flagship store at Travel Retail Worldwide in Haitang Bay, Sanya. Combining navy and gold tones with hints of platinum, the design of the flagship store takes its cues from Estée Lauder’s heritage and is designed to immerse consumers in the “luxury and modern glamour” of the brand, reports Travel Retail.For the Haitang Bay store, not only has Estée Lauder created cutting-edge displays to educate customers, but the company has also made sure that customers’ desire to be pampered and receive additional personal attention will be met. REPORT GAAP revenue increased 0.5 percent for the fiscal year 2014 to 1.2 billion dollars. On a constant currency basis, revenue increased 1.8 percent as compared to the prior year. For the fourth quarter, revenue was 206.5 million dollars, a decline of 9.7 percent as compared to the fourth quarter of 2013. On a constant currency basis, fourth quarter revenue declined 5 percent. Net loss attributable to common stockholders on a GAAP basis was 0.22 dollars per diluted share for the year and 0.70 dollars per diluted share for the fourth quarter. Non-GAAP adjusted net loss attributable to common stockholders was 30 million dollars in the quarter or compared with a non-GAAP adjusted net loss of 17.7 million dollars in the fourth quarter of 2013. “In the second half of 2014, the company eliminated non-core product categories, closed more than 100 stores, reduced headcount, and simplified our international operations. We are confident these moves will enable us to streamline our business model, focus on our biggest and most meaningful opportunities, and position the company for growth in the future,” Ribatt added. The company generated net loss attributable to common stockholders of 19 million dollars or 0.22 dollars per diluted share for the full year ended 2014, compared with net income of 10.4 million dollars or 0.12 dollars per diluted share in 2013. The company generated non-GAAP adjusted net income attributable to common stockholders of 50 million dollars for the year ended 2014 compared with non-GAAP adjusted net income of 72.8 million dollars during 2013.